August 17, 2018, ORANJESTAD, Aruba – The Aruba Hospitality and Security Foundation (AHSF) introduced a new Board of Directors this week. The new AHSF board consists of seven members to accomplish the foundations’ objectives imed at maintaining safety and security in the tourism sector. 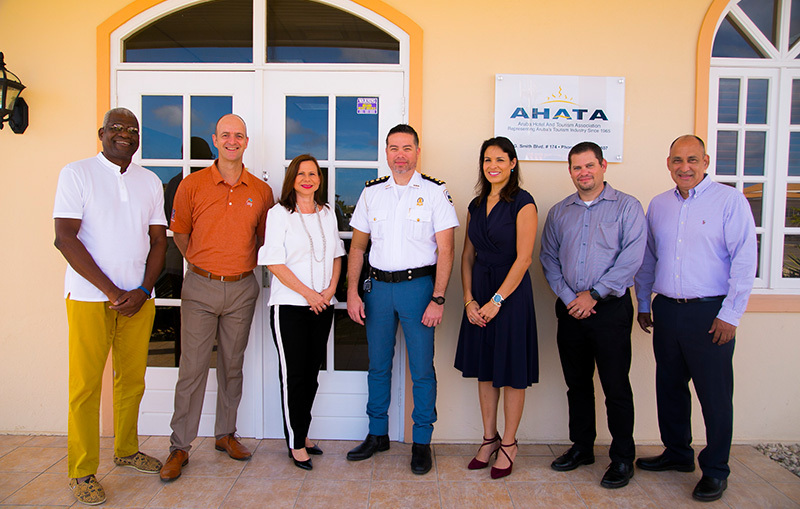 The new Board of the Aruba Hotel and Security Foundation (AHSF) met to review pending projects for 2018, including special training opportunities for the police force. In addition, they have begun to make plans for 2019 based on their strategic vision and will continue with efforts to help improve the effectiveness of the police and hotel security teams. These projects are funded by taxes paid by tourists during their hotel stay that are administered by the Aruba Tourism Authority (ATA). An important effort of the AHSF is the coordination and daily communication between the police force and hotel security teams. Recently, Tisa LaSorte, CEO of AHATA and new AHSF president, met with the Inspector Eric Soemers, new Chief of the Noord District, and Inspector Jonathan Henriquez, to introduce herself and continue the productive coordination between the foundation and the Aruban police.